The Hand Doctor Is In! Wrist sprain or Scaphoid fracture? I indicated that I’d be covering the many injuries that can occur when you fall forward, sacrificing the health of your hand and wrist to protect your face! I introduced you to FOOSH injuries which are common and usually heal in days to weeks. 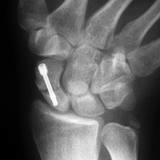 However the occurrence of fractures and dislocations of the wrist are very common. Certain fractures do not heal and require surgery with an embedded, headless screw. Here is an awesome video by Dr. Nabil Ebraheim in Toronto. Do I have Carpal Tunnel Sydrome?